Water poisoning, it is also known as water intoxication or just cause of overhydration (though really hyperhydration is what causes poisoning or intoxication). But beware, note that this factor is presented by consuming plenty of water per unit time, ie drink plenty of water and one not so much drink plenty of water throughout the day. Obviously everyone is different and therefore may suffer a hyperhydration with smaller amounts drinks water at one compared to others. 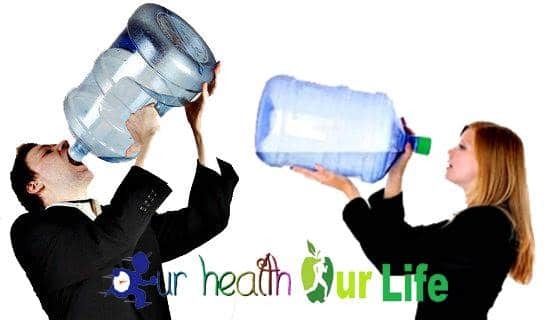 The standard recommendation is that a person can technically drink about 1.5 liters of water every hour maximum, that is more or less a glass of 200 to 300 mL every 10 minute. Of course the above if the person was completely healthy and did not have problems with his kidneys, myocardium and pituitary (endocrine gland responsible for hormone secretion whose function is to try to maintain the homeostatic balance). Now, still 1.5 liters of water per hour even if you do not try to drink one in the shortest time possible, it can become too much. And while the water is very important couple even good health and to aid in the digestive processes (hydrolysis) and biochemical processes of fat burning (lipolysis), simply I must say that everything in excess is bad and that therefore not because this is a precious and highly valued liquid be abused consumption. You might think that is an exaggeration and that is something rare for a person to die by consuming a lot of water, or it could imagine the consumption of alcoholic beverages for example, or energy drinks, among others, but you’ve been maybe never imagine there is the “poisoning caused by drinking lots of water“. And it is rare for cases of sudden deaths occur by drinking large amounts of water at one, but you did not know if there have been cases, very few cases around the world but has been. And some people who do not die almost instantly, have very close to death as cerebral edema, coma, sore brutal head excess pressure from the brain to the medulla oblongata symptoms, and of course other very obvious symptoms and less intense as dizziness, feeling sick, among others. Now one of the things that leads many people to take exaggerated amounts of water at one and during the day is wanting to lose weight, because just the water itself helps it, or good not exactly well water will help make a person burn more fat than the body deems necessary to “burn” according to physical activities, but proper hydration can optimize this type of biochemical processes and to optimize the transport of nutrients and oxygen (much needed for oxidation fat). In fact one could say that the oxygen we get through the air we breathe and not the one that can provide water drink, it is much more important in oxidative processes including the oxidation of fatty acids (from fat reserve). Hence breathe and training to improve aerobic capacity is the best in terms of burning fat directly, and not drinking large amounts of water like crazy. Is water poisoning being itself? and what occurs in the body because of this factor? When a hyperhydration per unit time (generated one), this leads to intoxication or water poisoning because what is generated in the body are merely altering effects negatively homeostasis and therefore affect health and welfare of the individual. Consume a lot of water at one generates various adverse effects, including some known as hyponatremia which is simply the dilution of sodium in a brutal amount of water in the blood plasma. Or seen from another point of view arguably sodium levels drop considerably, but really is not these levels to drop itself but will be very little relative to the amount of plasma water. What generates hyponatremia due to hyperhydration? When there brutal amounts of water in the plasma and thus lower the proportionate amounts of sodium, the body stops producing antidiuretic hormone which is a hormone controlling the reabsorption of water molecules by urine concentration and reducing their volume. That is, if this hormone can not be segregated because of this brutal amount of water drink, for just this large amount of water may not be eliminated or at least not quickly enough to prevent the aforementioned brain edema usually tend to be irreversible, which can lead to coma and indeed this can also lead to sudden death due to excessive pressure of the brain on the medulla oblongata thanks to the high blood pressure caused by the large amount of plasma water. Another cause of sudden death shortly mentioned when referring to poisoning or water poisoning due hyperhydration is, is the effect known as hemolysis, where many erythrocytes (red blood cells) die a “inadvertent overhydration”, ie be a hypotonic plasma (lots of water a few minerals in relation to this liquid) and therefore red blood cells will not have another to die by the pressure generated by this great overhydration (ie they will try to absorb water what crazy almost against his will, or they do not want to die but their biological mechanism tells them to continue absorbing water), or they will absorb or yes large amounts of water which will cause explode. So, how much water to take a day to avoid hyperhydration that threatens your health and your life? If you want something explained in detail, you need to read the article very well leave you this link.